Biases relative to the external structure of information. Conditions for accuracy: General or specific? (A.W. Kruglanski). The anchoring-adjustment heuristic in an "information rich, real world setting": knowledge assessment by experts (J.-P. Caverni and J.-L. Péris). Grouping and categorization in judgements of contingency (K. Fiedler and R. Graf). Framing biases in genetic risk perception (J. Huys, G. Evers-Kiebooms and G. d'Ydewalle). Students' conceptions in physics and mathematics: biases and helps (A. Weil-Barais and G. Vergnaud). Biases in reasoning pragmatics. Conversational and world knowledge constraints on deductive reasoning (V. Girotto and G. Politzer). Remembering conclusions we have inferred: what biases reveal (R.M.J. Byrne and P.N. Johnson-Laird). Syllogistic reasoning with probabilities and continuous truth values (J. Costermans and V. Heuschen). Belief bias and problem complexity in deductive reasoning (J. St. B.T. Evans and P. Pollard). Biases in children's conditional reasoning (V. Girotto). Are there biases in analogical reasoning? (M.T.G. Keane). Pragmatic reasoning schemas for conditional promises: context and representation (H. Markovits and C. Lesage). Non-logical solving of categorical syllogisms (G. Politzer). Response biases and context effects. Response bias and contextual effects: When biased? (A. Parducci). Psychophysical approaches, contextual effects and response bias (C. Bonnet). Context effects in face recognition: below response bias. The contribution of a simulation (A.-C. Schreiber, S. Rousset and G. Tiberghien). The relative importance of facial expression and context information in emotion attributions - Biases, influence factors, and paradigms (H.G. Wallbott). Methods for determining the locus of context effects in judgment (D.H. Wedell). Biases relative to the categorization activity. Social biases in categorization processes (W. Doise). Cognitive biases in social categorization: process and consequences (C. N. Macrae and M.R.C. Hewstone). Biases in categorization (E.A. Das-Smaal). Studies on self-centered assimilation processes (J.-P. Codol). Specificity and categorization in judgment: a cognitive approach to stereotypes (J.-M. Fabre). Biases in probabilistic judgment. Biases in probabilistic judgment: a historical perspective (G. Wright and P. Ayton). Are two judges better than one? On the realism in confidence judgments by pairs and individuals (C.M. Allwood and C.-G. Björhag). Uncertain memories: evaluating the competence of probabilistic cognition (P. Ayton and G. Wright). Theories of bias in probability judgement (M.H. Birnbaum, C.J Anderson and L.G. Hynan). Overconfidence in self-assessment of motor skill performance (N. Harvey). Bias in meta-memory performance and its implications for models of memory structure (A.G.R. McClelland, A.S. Coulson and S.E. Icke). Biases and cognitive aids. Cognitive aids and debiasing methods: Can cognitive pills cure cognitive ills? (G. Keren). Confirmation bias, problem-solving and cognitive models (D.W. Green). A study of two biases in probabilistic judgments: Representativeness and equiprobability (M.-P. Lecoutre, J.-L. Durand and J. Cordier). Many studies in cognitive psychology have provided evidence of systematic deviations in cognitive task performance relative to that dictated by optimality, rationality, or coherency. The texts in this volume present an account of research into the cognitive biases observed on various tasks: reasoning, categorization, evaluation, and probabilistic and confidence judgments. 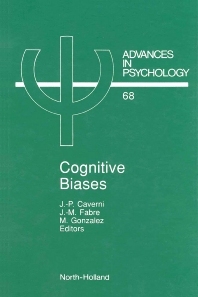 The authors have attempted to discern the contribution of the study of bias to our understanding of the cognitive processes involved in each case, rather than proposing an inventory of the different types of biases. A special section has been devoted to studies on the correction of biases and cognitive aids.